A rush to meet deadlines for securing production tax credits (PTCs) in the US could lead to project cancellations and postponements and put billions of dollars of revenue at risk, analysts predict. More than 23GW of new capacity is expected to be installed in 2019 and 2020, according to forecasts from Wood Mackenzie Power and Renewables (WMPR). But nearly a quarter of this capacity might be unrealised due to a shortage in specialised trailer and railcar fleets for transporting wind turbines, blades and towers. 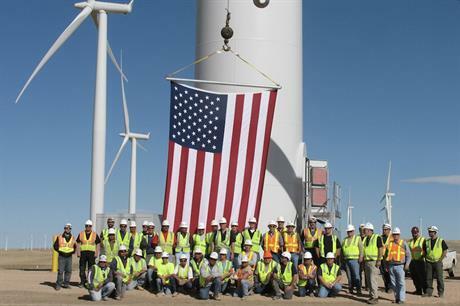 The US government approved the extension and five-year phase-out of the PTC, the wind power industry’s key support mechanism, in 2015. Developers will receive 40% of the $0.023/kWh PTC for a project’s output if they start construction in 2019, but will receive no federal support beyond the end of the year. Analysts at Wood Mackenzie Power and Renewables (WMPR) believe developers scrambling to start construction this year and secure the PTC payments could push up installation rates to 11GW in 2019 (up from an expected 8.4GW last year) and then up to 12.9GW in 2020. But this ensuing competition for transportation options will create shortages in the supply chain. "Increased demand for transportation capacity due to growth in partial repowering activity, logistics requirements, and competition from other industrial sectors could severely hamper the transportation segment’s ability to ship components," Dan Shreve, head of global wind research at WMPR, said. WMPR believes 23% of the forecast capacity (5.5GW of the 23.9GW forecast) in the US is at risk due to shortages in specialised trailer and railcar fleets for wind turbines, blades and towers, as developers rush to secure PTC payments before the scheme’s expiration. However, it also expects the supply chain will take the necessary steps to address this risk, dampening the effects of these shortages to the overall market demand. Nevertheless, even after efforts to avoid this shortfall, the analysts still expect turbine installations in the next two years could be 1.1GW below forecasts — a 366MW deficit in 2019 and a 720MW discrepancy in 2020. This underachievement could represent a loss of more than $800 million in turbine sales, and up to $1.3 billion in unrealised PTC payments over the ten-year tax credit period, WMPR stated in a new study. Shreve added: "While we've seen upticks in demand put pressure on transportation capacity in the past, the total level of effort required from logistics providers this time around will be substantially higher than during past peaks. "New turbine technology is producing higher-capacity turbines, but this results in further strain on the supply chain, as components are larger and heavier, and more component shipments are needed per turbine. "This in turn increases requirements for highway escorts, reduces transportation equipment cycle times, and increases demand for larger cranes." Prioritising shipments to the most efficient wind farms.